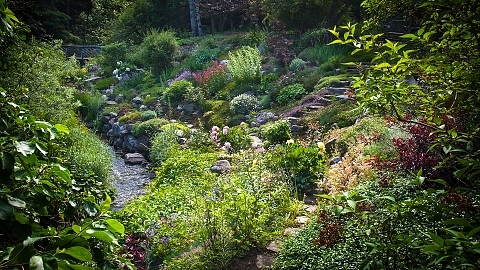 One of the wonders of Québec and ranked among Canada's garden destinations, the Reford Gardens/Jardins de Métis are a verdant paradise on the banks of the St. Lawrence River. 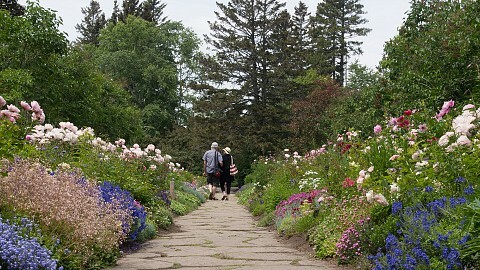 A national historic site, they were created by a passionate gardener and plant lover, Elsie Reford, between 1926 and 1958. Visitors to this historic domain of more 200 acres can admire the splendours of some 3,000 species and varieties of native and exotic plants displayed in fifteen gardens. In addition to your experience, the Vegetable Garden and the Garden Tool Museum. Discover the edible flowers and herbs that inspire the chef of the Estevan Lodge Restaurant. The Eco House ERE 132 is a interpretation centre that offer a window into the techniques and technologies of green building. Energy efficiency, minimizing water consumption, waste management, air quality, low impact materials, ecological gardening, productive plantings – these are some of the many themes that will be presented to visitors during their visit of ERE 132. Elsie through the eyes of…, the exhibition presented in Estevan Lodge, introduces visitors to the life and times of Elsie Reford. Best-known for her gardens, she had many other interests, in politics, women's health, art and international affairs. Her involvement in debates over public policy brought her into contact with many of the leading figures of the day. For the first time, visitors will have a glimpse into the life of this remarkable women, presented through images, objects and reminiscences in the thirteen exhibition rooms of Estevan Lodge. One of the highlights of any visit is Estevan Lodge, the 1887 fishing lodge built by Lord Mount Stephen. Today, it welcomes visitors to its dining rooms and exhibitions. Let us entice you to the gardens for Sunday brunch or a literary tea in the company of a noted author. Our chef prepares his menu daily to feature local produce and flowers picked in the gardens. The dining rooms offer lunch throughout the week, thematic dinners and musical brunches on Sundays. From the end of June, the International Garden Festival presents conceptual gardens by leading designers from around the world. For its 20th anniversary edition, the Festival is seeking to explore new directions and continue our exploration of play. “Terrains de jeu” is fertile ground for creativity! Umbrellas and strollers are available in the event of rain. Wheelchairs are available free of charge (reservations recommended). Gardens schedule: daily, June 1 to October 6, 2019. The gardens open at 8:30 a.m. and close at 6 p.m. in June, September and October (last admission at 5 p.m.) and 8 p.m. in July and August (last admission at 6 p.m.). Restaurant schedule: daily, June 14 to August 31, 2019, 11:30 am to 2 p.m. Admission fees. Free for children 13 and under. Accommodation packages available with hotels, motels, auberges and B&Bs in the area.